SoilHack was set up to provide a space for people to collaborate in research and sharing information to help us both better understand our soils and improve their health, having been inspired by the DIY spirit of the Farm Hack movement. Over the past few years an increasing number of people have been sharing stories of how they’ve transformed their soils (and in some cases workloads) through applying novel methods: no-dig, cover cropping, biochar, agroforestry, etc etc. Given the current horrific rates of soil depletion, and the game-changing role that soil carbon could play in regenerating the biosphere this is significant. The challenge, especially for people who are full-time producers, is to somehow get a toehold on the growing body of soil research which helps to understand why these practices work, as well as getting a sense of how they’d be relevant in a given situation. SoilHack was created to become a self-organising network for sharing knowledge. 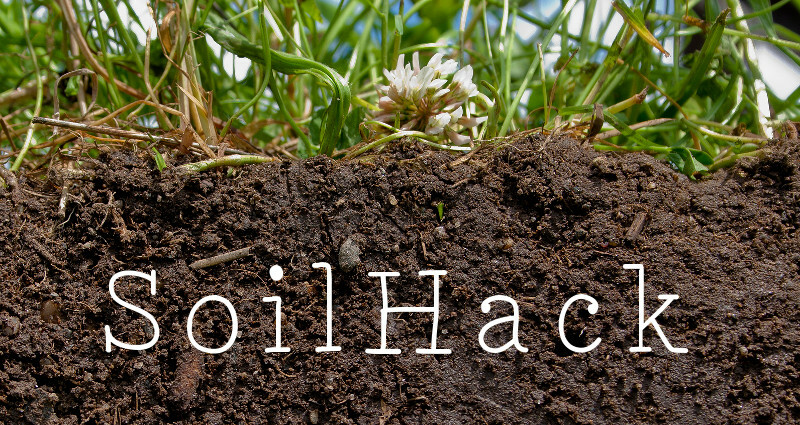 Lots of people have been involved collating good resources on this wiki, participating on a soil events email list, running a Twitter account, contributing to the SoilHack Gatherings, networking or presenting at Farm Hack and sustainable agriculture themed events. You are invited to contribute your experience, insight, and curiosity to this effort so that we can begin to rapidly grow our collective intelligence, and in turn, all become its benefactors. This knowledge needs spreading and putting into action. Read about our vision in this article. The second SoilHack Gathering took place 26th – 27th May 2018 – near Street, Somerset Photos, recordings and documents from the gathering have being uploaded to archive.org - check them out here. The first SoilHack Gathering was held over the weekend of 27th/28th May 2017 near Street, Somerset. Photos and recordings from the gathering are being uploaded to archive.org - check them out here. This is the 'homepage' of SoilHack. All SoilHack related tools and activities will be listed here. This page is a wiki - that means that anyone can register (click the link top right of this page) and then edit the text here (click on the edit tab once you are registered). Wikis tend to be much more valuable when lots of people contribute to them. If you think something should be added to this page but haven't got time, or don't know how to lay out the text on the page, you can just add it to the page and someone else can come along later and tidy it up - isn't collaboration great? The other great things about wiki pages is that you can elect to be notified when a page is updated and you can look at all the previous revisions of a page, see who has done what to it, and can get back to an older version if somebody somehow "breaks" the page. So when you edit you don't have to worry too much about accidentally messing things up, its easily fixed. This is a low volume email list for organising SoilHack and to announce soil releated events (currently UK events). We encourage people to use other internet based discussion venues (see recommendations below) for general soil related discussion as there are already a lot of great conversations going on. go and subscribe here Once you have subscribed you will get a confirmation email to which you must respond before your subscription will be live. These bookmarks are tagged (eg. compost-tea, video, microscope etc.) and you can click on the + symbols next to the tags on the right to make a progressively smaller, more focused list of websites. SANET-MG, 'a discussion group about sustainable agriculture, has been in continuous operation since October 1991.' USA based, lots of experienced growers and academics, has discussion about soil, soilfoodweb, compost etc. - 2 emails a day average. Discussion forums: Logical Gardener - lots of useful discussion about compost, vermicompost, compost tea and microscopy. We also intend to organise webinars using an internet conferencing tool (quite possibly Skype - we have struggled to find a good open-source alternative) where sessions can be devoted to particular aspects of soil, and people with relevant experiences invited to make presentations and answer questions. Examples of topics we could cover are microscopy, compost teas, cover crops, biochar, no-dig / min-till systems, designing research studies. Hopefully we will also put on a real-life event at some point (after the growing season has ended would likely be the most sensible time for this) where members of the community can run workshops on these subjects. The idea of this group is that those of us wishing to deepen our understanding of soils and to do something to improve their health can do so more effectively if we can share what we're learning with each other. Unfortunately we haven't always found something that ticks all the boxes. As this is an open project, if you feel we are barking up the wrong tree or know other great tools to use in this effort please feel free to add them here. Have you seen the Prosoil project at IBERS, Aberystwyth? [http://www.prosoilproject.uk/en/] Collaborative approach to developing soil health using development farms backed by controlled experimtents.